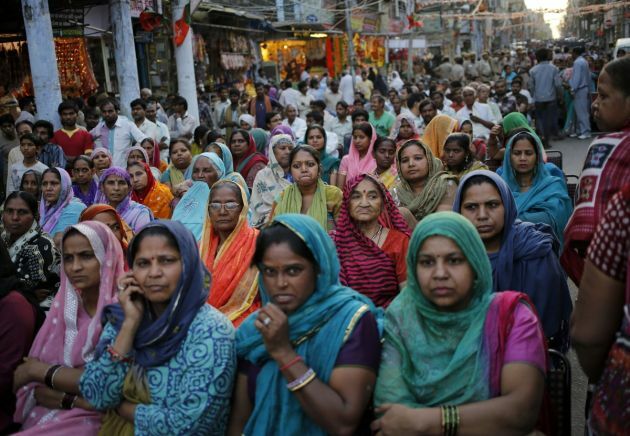 (Photo: REUTERS / Anindito Mukherjee)Supporters of India's main opposition Bharatiya Janata Party (BJP) listen to a speech by BJP leader Lal Krishna Advani, during a public meeting ahead of the general elections in the old quarters of Delhi April 4, 2014. India, the world's largest democracy, will hold its general election in nine stages staggered between April 7 and May 12. NEW DELHI (Reuters) - The imam of India's largest mosque endorsed the ruling Congress party on Friday ahead of a general election, a boost for the beleaguered party expected to be defeated by the Hindu nationalist Bharatiya Janata Party (BJP) in nationwide polls. Maulana Syed Ahmed Bukhari appealed to India's Muslims, who at 13 percent of the population are the country's largest religious minority, to vote for the Congress. "Today, I announce my support for the Congress in the 2014 Lok Sabha elections," Bukhari, based at the Jama Masjid mosque in Delhi's old quarter, told a news conference. The focus of the campaign has changed over the past week from development to a more religious tone, with the BJP accusing Congress of polarising the country along religious lines by overtly courting the votes of Muslims. Results of the election, held over nine stages starting next Monday, are due to be announced on May 16. At a rally on Wednesday, the BJP's prime ministerial candidate, Narendra Modi, accused the Congress-led coalition of promoting the slaughter of cows, viewed as sacred by many of the country's majority Hindus. Critics said the comments were also a veiled swipe at Muslims, who run much of the abattoir business in India. Modi has focussed his campaign speeches on the economy and development, in a bid to shed an image as a Hindu hardliner that stems from religious riots more than a decade ago. He denies allegations he did not stop the riots in Gujarat in 2002, when at least 1,000 people, mainly Muslims, were killed in retaliation for the death of Hindu pilgrims in an attack on a train. A Supreme Court inquiry concluded there was not enough evidence to try him. Modi rejects any suggestion of bias against Muslims, although his party rose to prominence after leading a campaign that led to the destruction of the Babri Masjid mosque in Uttar Pradesh state in 1992. That triggered rioting that killed some 2,000 people. The party said the mosque was built on a Hindu holy site. The topic of the mosque demolition was revisited this week by investigative website Cobrapost, which published the results of an undercover investigation it said showed the mosque destruction was "planned sabotage" and not random mob violence. In response, the BJP said the investigation had been funded by Congress and timed to affect the elections. Modi's campaign was bolstered by an opinion poll on Thursday showing his party was set to make big gains in northern states. Polls have repeatedly indicated that although the BJP will emerge as the largest single party in parliament, it is unlikely to win an outright majority. Congress and its allies are battling to weaken Modi's chances of building a coalition.